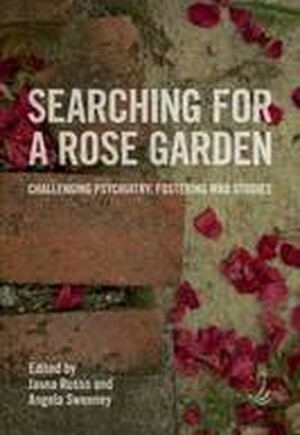 Searching for a Rose Garden is an incisive critique of all that is unhelpful about sanestream understandings of and responses to mental distress. Drawing on world-wide survivor activism and scholarship, it explores the toxicity of psychiatry and the co-option and corruption of survivor knowledge and practice by the mainstream. Chapters on survivor research and theory reveal the constant battle to establish and maintain a safe space for experiential knowledge within academia and beyond. Other chapters explore how survivor-developed projects and practices are cultivating a wealth of bright blooms in the most hostile of environments, providing an important vision for the future. Foreword by Brenda A. LeFrancois. SETTING THE SCENE: 1. Responses to a legacy of harm, Mary O'Hagan; 2. Alternatives or a way of life? Bhargavi Davar; 3. The haunting can end: trauma-informed approaches in healing from abuse and adversity, Beth Filson; 4.The role of survivor knowledge in creating alternatives to psychiatry, Peter Beresford; 5. The co-optation of survivor knowledge: the danger of substituted values and voice, Darby Penney and Laura Prescott. SURVIVOR-PRODUCED KNOWLEDGE: 6. The transformative potential of survivor research, Angela Sweeney; 7.Towards our own framework, or reclaiming madness part two, Jasna Russo; 8. Whiteness in psychiatry: the madness of European misdiagnosis, Colin King; 9. Deciding to be alive: self-injury and survival, Clare Shaw; 10. Thinking (differently) about suicide, David Webb; 11. Community Treatment Orders: once a rosy deinstitutional notion, Erick Fabris. SURVIVOR-CONTROLLED PRACTICE: 12. Becoming part of each other's narratives: Intentional Peer Support, Beth Filson and Shery Mead; 13. We did it our way: Women's Independent Alcohol Support, Patsy Staddon; 14. Sexual violence in childhood: demarketing treatment options and strengthening our own agency, Zofia Rubinsztajn; 15.The Personal Ombudsman: an example of supported decision making, Maths Jesperson; 16. Kindred Minds: a personal perspective, Renuka Bhakta; 17. The Sunrise Project: helping adults recover from psychiatric drugs Terry Simpson; Working in partnership:18. More voice, less ventriloquism: building a mental health recovery archive, Dolly Sen and Anna Sexton; 19. Teaching (like) crazy in a mad-positive school: exploring the charms of recursion, Danielle Landry and Kathryn Church; 20. Peer workers in the mental health system: a transformative or collusive experiment? Celia Brown and Peter Stastny; 21. Dilemmas of identity and power, Alison Faulkner; 22. Is partnership a dirty word? Cath Roper; 23. Co-creating the ways we carry each other: reflections on being an ally and a double agent Reima Ana Maglajlic. THE SEARCH GOES ON.